This easy-to-grow, popular North American native bears striking, rich rosy-pink, daisy-like flowers in summer that attract butterflies. Plants are heat- and drought-tolerant, and blooms are used for cut- and dried-flower arrangements. 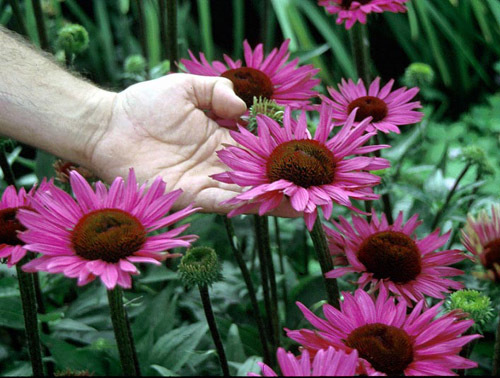 The drug Echinacea, used to boost the immune system, comes from this genus. Tolerates light shade, especially in areas with hot weather where shade enhances petal color. Prefers deep, well-drained soil high in organic matter. Solitary blooms borne on erect stems rising above the foliage. aggressive - Self-sows prolifically if seedheads are allowed to develop. native to North America - Central U.S.
beneficial insects - Including beneficial soldier beetles in late summer. dried flowers - The seed heads used in arrangements. Propagate by seed, cuttings, division or separation - Divide in spring or fall. Roots don't like to be disturbed. Make root cuttings in late fall or early winter. Seed is easy to germinate at 70 F. But seeds collected from plants will not breed true and will require two or more years of growth before flowering. Deadhead to prolong flowering, prevent self seeding and focus attention on peaking flowers. If desired, leave fall blooms on the plant to form seedheads for winter interest. This will attract birds, but also results in prodigeous self-seeding. To encouraged delayed blooming for fall enjoyment, cut plants back by half in early summer or cut back by 1 foot when coming into bloom. For maximum bloom period, cut back some plants in the garden as described, and leave others to flower at their normal earlier time. Seldom needs division. Roots don't like to be disturbed. 'Alba' grows 3 feet tall and bears creamy white blooms. 'Bravado' grows 3 feet tall and bears rosy red blooms that are 4 inches or more wide. 'Bressingham Hybrids' have light rose-red petals and are very reliable. 'Bright Star' ('Leuchtstern') grows 2.5 feet tall and bears rose-purple blooms. 'Finale White': grows 1 to 1.5 feet tall and bears cream-colored blooms and green-tinted central disks. 'Kim's Knee High' grows 1 foot tall and has pink drooping petals. 'Magnus' bears rosy-violet blooms that are more than 7 inches wide. 'Robert Bloom' grows 3 feet tall and bears reddish-purple blooms that are 5 to 8 inches in diameter. 'Springbrook's Crimson Star' grows 2 feet tall and bears with deep red blooms. 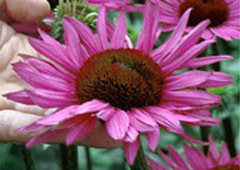 'The King' grows 4 to 5 feet tall and bears flowers with prominent central disks and arching purple-pink petals. 'White King' ('White Lustre') grows 2.5 feet tall and bears cream-colored blooms. 'White Swan' grows 2 feet tall and bears white blooms.